The process of inventing and bringing a product into the marketplace is fraught with legal pitfalls, costly dead ends, confusing runarounds, and missed opportunities. Yet through the maze of hurdles to overcome, some seem to navigate the path to success without a worry. So what do these people know that the struggling inventor does not? They know enough to ask the right questions and find the appropriate resources they can count on. Luck may play a part, but having a team of experts to learn from will absolutely increase your odds of making it. Now, in Secrets of Successful Inventing, writer and importing professional Edith Tolchin has put together sixteen top experts who offer valuable information related to the various steps involved in bringing an invention to market. Ms. Tolchin has created an all-in-one guide that addresses the many critical issues that beginning inventors might never even consider. From prototyping to patenting, from licensing to marketing, each expert gives clear and practical advice to help inventors reach their goals. The book presents the chapters in a logical sequence that will allow the fledgling inventor to navigate the waters of product development. By following the steps offered and by heeding the words of these seasoned professionals, the reader will stand a better chance of avoiding pitfalls and finding success at journey�s end. Normally, novice inventors spend thousands of dollars attending lectures and workshops that they hope will prepare them for the challenges that lie ahead. 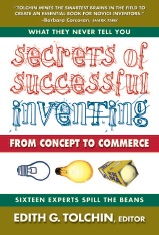 In Secrets of Successful Inventing, Edith Tolchin provides a straightforward guide to the basics as well as a useful resource to take your idea to the next level. Edith G. Tolchin, �The Sourcing Lady,� started EGT Global Trading in 1997, with a goal to link US inventors with Asian manufacturers, and to provide an exclusive import service for sourcing, quality control, production testing and safety issues, manufacturing, international financing, air and ocean shipping, customs clearance arrangements, and dock-to-door delivery. Edith is also a contributing editor and freelance writer for Inventors Digest Magazine. For information on bulk prices, special editions, or custom versions of this book, contact the Marketing Department of Square One Publishers at 516-535-2010 or sq1publish@aol.com.